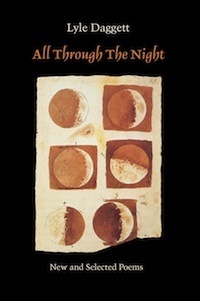 All Through the Night: New and Selected Poems is Minnesota poet Lyle Daggett’s seventh book of poetry, a selection of his previous books published from 1976 through 2009. In an Author’s Afterword Daggett places himself in a tradition of poets including Neruda, Thomas McGrath, Lorca, and Muriel Rukeyser—poets representing a social muse in poetry neglected in mainstream U.S. poetry since 1945. In the poem “neruda and le sueur at north star lake” (yes, they did meet but Daggett confesses he imagined most of the details), the poem elegantly describes a connection between Neruda and Le Sueur as “we touched and clasped hands” despite knowing little of each other’s language. The making of community even a community like the one between Neruda and Le Sueur reoccurs in many of Daggett’s poems. The poem “neruda and le sueur at north lake” has alternating stanzas: Le Sueur sings of the gorgeous Midwest lakeside while Neruda describes his landscape of stellar mountains in Chile. At another point Le Sueur says that despite the music of wind and crickets over the lake “we are living through the ice age, /fossil empire, ages of travail.” Together Neruda and Le Sueur “build around us the house/of the living future.” Daggett, a child of Shelly and Wordsworth, is a superb poet of the natural world but he always connects natural geography with a belief in a utopian future. In another poem in memory of Tom McGrath titled “later report from an agent of the workers’ revolution….” Daggett brilliantly evokes McGrath elderly and sick but still feisty and giving an inspired public reading of his poetry. McGrath is present in every line of this great Whitmanesque 14-page poem which ends “and we are still there at work/ building the road” in still another poem ending with the belief that humans together can bring that utopian future closer. Daggett, although a left-wing radical, ironically enough follows tradition in his poems of praise to his elders. Another group of poems in this book are about communal “we” in the work of painters and photographers. “Scene taken from the style of edward hopper” rewrites a scene from Hopper’s famous painting “Nighthawks” where Daggett portraying the awful Midwestern lonely restaurant has a woman walking in at the end or a poem as a symbol of possible human connection. “The golden gate before the bridge on a photograph” is a poem on a photo of Ansel Adams showing the “human surging end to end/each day.” Lastly, “staircase” is a meditation on a photo of Aleksandr Rodchenko of a woman worker ascending a black and white staircase which he sees symbolic of a better future. The poet is a master of many landscape poems where he brilliantly paints portraits of the contemporary American land such as “spotted sandpiper by lake calhoun ….” where he leaves his alienating “whitewashed/cold-storage brick room” in which he works to walk by the lakeside following a sandpiper. Then the poet uses Whitmanesque descriptions showing how the sandpiper’s twice yearly migrations “trace the span of an continent.” In “greyhound station, Muskogee, early Sunday morning” the poet is near an old abandoned factory and “from deep in the bedrock the music/ of ancient workers bubbles up to me.” In “the flowers at los almos” the poet contrast the coldness of the “high chainlink fences and signs” along with soldiers at the entrance to the grove nearby of wildly beautiful desert flowers “quiet in the insatiable light.” These landscape poems show the American landscape in a series of contrasts between natural beauty and military-industrial devastation. Like Neruda Daggett is a love poet full of love for the land. Throughout this book Daggett has political poems about the U.S. wars during the last 50 years such as “warrior,” about an acquantiance who was in the Air Force during Vietnam, to “ar hard y nos” which is Welsh for the lullaby “All Through the Night,” the title of his book, about the Iraq War. “Ar hard y nos” creates a contrast between the man who snows death with his war on ancient cities at the same time he makes banal jokes on TV and the patient resistors who watch all through the night gathering strength. While this man of death dominates the TV and the national discourse, the poet keeps his faith in his community: “we are the builders/of the days and the keepers/ of the nights,/ and …the sowers of the communes of/ earthly carnations/ and when morning comes/ we will be ready.” Daggett has followed the example of his elders to dedicating his life as a poet writing an anti-war poetry through the long night of the Iraq War just as they watched and wrote through their long nights. Political poetry can use many different kinds of rhetoric. In the 1930s Kenneth Burke, who worked with the leftists in the leftwing League of American Writers and the contributors to Partisan Review, the New Masses, the Nation, and the New Republic, also began a discussion of rhetoric in 1930s literature where he argued that images of worker’s suffering should be connected with a utopian vision that “effectively mobilizes allegiance and action.” Looking at the rhetoric in Daggett’s poetry, his poem “questions from a reading worker” in memory of radical labor organizer Al Nurmi uses a brilliant rhetoric bringing alive this worker/reader whose father was a Bolshevik in Finland and who with Brecht in his hand is lecturing about his working life in a university classroom. In the second section the poet brings to life thirty people holding a wake and singing by the shores of the Mississippi for Nurmi after his death. Here Daggett reveals a specific history of Finnish-American radicalism, one of the few times he deals with a specific working class history in detail. The rhetoric works because the poet has created common bonds with the reader in terms of respect for elders, remembering immigrant history, mourning in a community, and retaining a utopian vision. Another poem “Communism Is a Round Rising Sun,” a three-page recitation of the glories in communism including praising the dictator Stalin, is a rhetorical failure. The first line of Daggett’s poem says, “Communism is the rose and the lilac the future and the arcing gull.” For those who don’t believe Communism is the future, the first three pages of “Communism Is a Round Rising Sun” are an alienating read as the reader is outside feeling excluded listening to the poet chant for three tedious pages to those within his faith community. Instead of looking at Communism in the abstract as this poem does, let’s look at the particular 1940s history of Daggett’s mentor Tom McGrath. According to English historian E.P. Thompson, Tom McGrath’s good friend, during the late 1940s and early 1950s McGrath used Marxist writer Christopher Caudwell to criticize orthodoxy within the Community Party. When the dissidents lost, McGrath and many others left the Communist Party, and for the next forty years McGrath was an independent radical. In England E.P. Thompson became a New Left historian who would rethink English history in his major text The Making of the English Working Class detailing the 500-year struggle of the English working class for literacy, free speech, the suffrage, and unions. Similar New Left historians such as Raymond Williams in England or in the United States historian Howard Zinn or Tom McGrath himself or many others have detailed specific histories—of how working class people, women, blacks et al. have also struggled for democracy and equality for hundreds of years. If Daggett can so wonderfully connect in his poetry to the Finish-American history of Al Numi, why can’t he also connect to other specific histories of other American working people and create more poems that have a rhetoric that shares common bonds with his readers based on shared histories? Despite these flaws, Lyle Daggett in his book All Through the Night has created not just a beautiful but also necessary poetry for 2013, a poetry like bread. Of course, Neruda said that poetry should be like bread and “shared by all, by scholars and peasants, by all that vast, incredible family of humanity.” Daggett has listened well to his master Tom McGrath to make a such a “useful poetry,” a poetry we need now drenched in love for our land and for the people in these dark times.